Halo 4 has all kinds of pressure on it. External pressure from the fans that it’ll live up to the standard set by the previous three games to feature the Master Chief, the game’s instantly recognisable hero. Internal pressure from new caretaker 343 Industries to deliver a knock-out blow with its first Halo game and take the series that launched with the birth of the original Xbox back in 2001 in a new direction – while still keeping things familiar. After some hands-on time with the game’s campaign mode, I reckon 343 has delivered something special here: a game that stays true to the series started by Bungie all those years back but one that delves deeper in the Master Chief’s psyche and his relationship with his AI companion, Cortana, who is nearing the end of her lifespan. AIs, we’re told, usually survive around seven years but Cortana is nearing eight years old, and it’s clear that Master Chief, the once stoic and usually untalkative combatant, is concerned that she’ll succumb to the AI equivalent of dementia. It’s an added element that he has to take into account as he and Cortana take on a new foe, the Prometheans. Presenting a more human Master Chief is a smart move by 343 and after an almost five-year absence since we last saw the Master Chief, it’s good to see that 343 aren’t afraid to try something new. Look, I like Halo as a series but it’s not my go-to game when I want something to play. I always thought the genetically enhanced soldier was a little too robotic at times, but this time, he’s more in touch with his human side, and I like that. This is a Master Chief who is in touch with his humanity – and he’s also a lot more talkative this time around, which will please some and maybe annoy others. I liked it. I played through the third mission in the campaign, which finds Master Chief and Cortana on a mysterious planet called Requiem, and this is the first time we’re introduced to new enemies, which prove smarter and when in a pack, tougher than Halo’s more common Covenant forces. 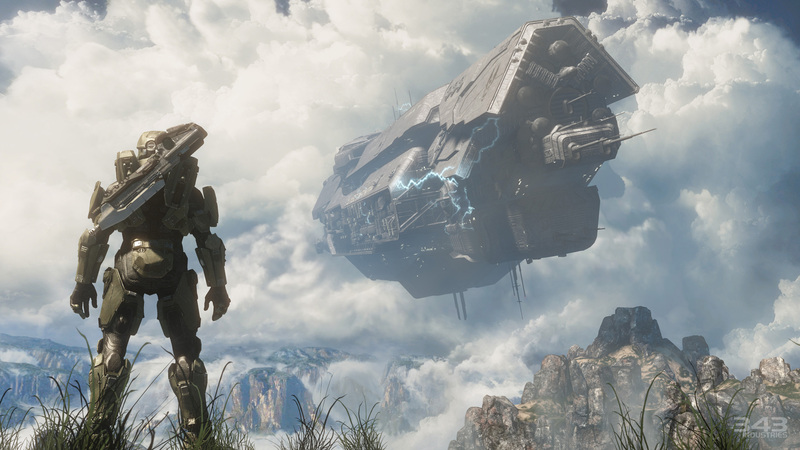 Josh Holmes, Halo 4’s creative director, advised us to dial down the difficulty a notch that we’re used to – and after facing off against Promethean knights and crawlers, I can see why. Knights, while not that hard to kill on their own, especially if shotgunned to the head using one of their own Scattershot weapons (nicely disintegrating into a pile of glowing particles) – become more dangerous thanks to the watchers, which fly above the battlefield, regenerating wounded Knights and shielding them from Master Chief’s fire. I found it pays to take out the watcher as soon as you can, preventing wounded Knights from healing, then concentrate on the advancing Knights and crawlers, which can surround you quickly and scale walls and rock faces. 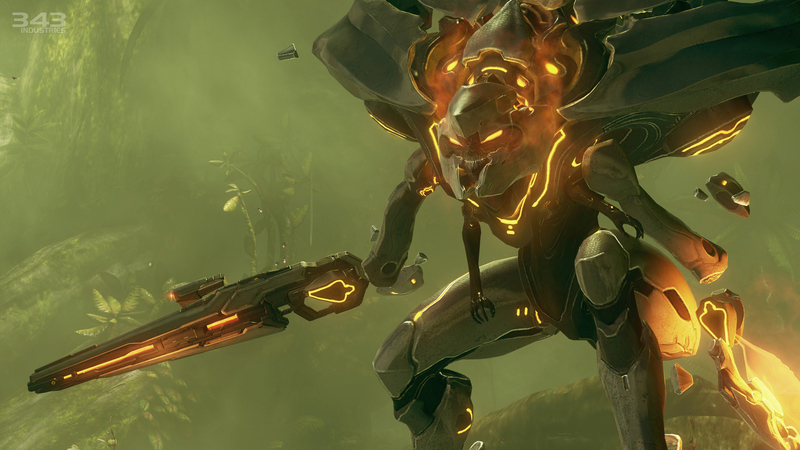 Of course, with new enemies come new weapons – and the Promethean armoury doesn’t disappoint. While the weapons are essentially the alien equivalent of what Master Chief is used to wielding – shotguns, rapid fire weapons – ammunition for his standard issue weaponry is scarce so it pays to swap to a Promethean weapon as soon as you can. Something I absolutely loved with the Promethean weapons is that when you reload them the individual components almost explode outward slightly then snap back into place once the reload is done. It’s a small but impressive feature. I learned pretty quickly that when overwhelmed by foes, using fast-firing weapons like the Suppressor and Boltshot initially to pick off fast-moving enemies from a safe distance worked extremely well – then I went in with something like the Scattershot to pick off the stragglers. But it’s not only the Prometheans the Master Chief has to deal with this time around and I was surprised to walk into a fire fight between Covenant forces and the Prometheans. I stood back and just watched, not sure whether I should help either side. 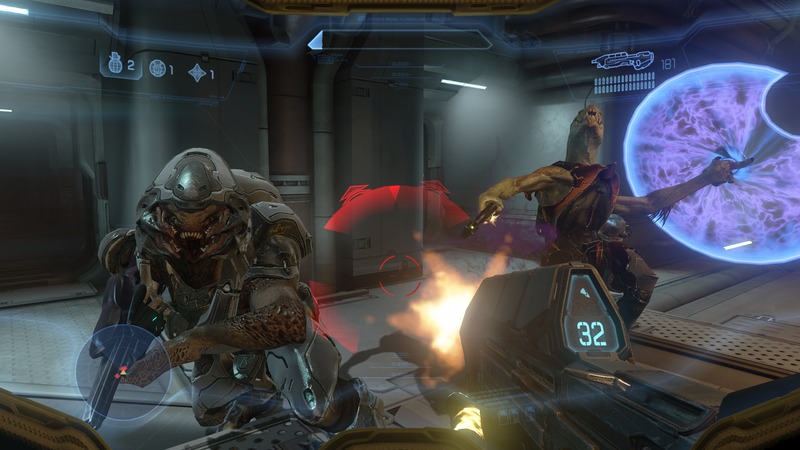 I eventually decided to wait until the Prometheans had wiped out most of the Covenant then took on the rest myself. The campaign finished with a revelation that surprised me – but Holmes asked us not to reveal what happened, and I’m going to respect that, for him and for readers. As I said earlier, I’m not a fanatical Halo fanboi but I came away from my time playing Halo 4’s campaign – and some multi-player which featured mechs that can dominate the battlefield if you let them, and the Spartan Ops mode (bite-sized chunks of co-operative episodic content) – pleasantly surprised and waiting for November 6, when the game is released worldwide. Hopefully I’ve finished Arkane’s Dishonored by then (that, is a game that you need to play: it is something special. I’ll give my thoughts on that another time). I think Halo 4 is an important addition to the series and a necessary one that has convinced me that Master Chief is actually human and cares about those around him, especially Cortana. It’s definitely going to be interesting seeing how the relationship between him and Cortana develops during Halo 4.